In 2016, we will be joining in for another year with the "The Sibling Portrait Project" that was created by Lucy of Dear Beautiful. 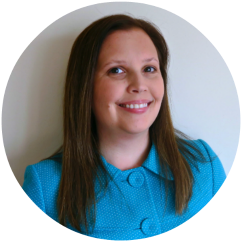 On the 15th of each month, I join a group of bloggers to document the very special relationship between brothers and sisters. This also creates a visual timeline of how quickly our children are growing. My favourite photos are of the first photo of a baby joining a family and sometimes promoting an only child to "Big Sister" or "Big Brother". Search #SiblingsProject on Twitter and Instagram or follow @siblings_photos on Instagram to view the monthly collection of photos. This is the last month of Sibling Project for 2016. 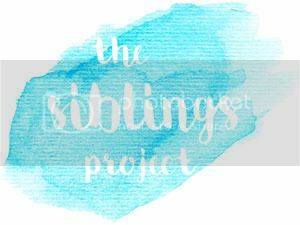 This is the 2nd year that we have participated in the Siblings Project but this year I decided to keep all the photos together in one blog post. Big Sister and Little Brother have both experience some big milestones this this year but Little Brother is a completely different boy from 12 months ago. Almost a year later, Little Brother is able to walk but would rather run free around town. He is no longer interested in sitting in the stroller watching the world pass by. He wants dash around looking in every shop and making people smile at his cheeky grin. He has a full set of teeth that he loves to brush. He is able to express wants and his thoughts. I was always amazed when Big Sister started talking but Little Brother is even more advised at a little over 2 years old. 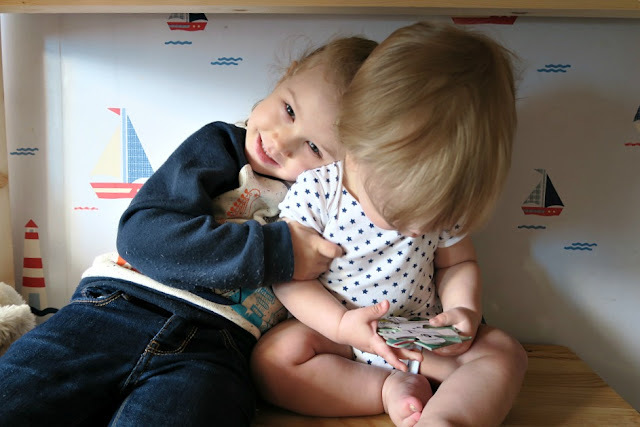 Until recently, it was Big Sister that was making sure he did not get hurt or in trouble but now Little Brother is often the person screaming the loudest for Big Sister to "stop running" or to come back. He gives her hugs when she is sad and her biggest fan. He loves washing the dishes and feeding your food. If he hears music playing, he will start dancing even if it is in the middle of the grocery store. He loves slides as much as Big Sister and is fearless like her. Big Sister has reached the huge milestone of going to school. She continues to adjust well to the new routine but is looking forward to the Christmas holidays. She loves running as super hero and making her Little Brother laugh. She is starting to read words and knows how to spell a couple too. She always wants to wear matching clothes as her Little Brother. She was big helper at her Little Brother's birthday party and made sure he could open his gift. She would make a whole in the wrapping paper and then give the present to Little Brother to rip open. Big Sister and Little Brother were very brave when they moved home this last month. They love their new joint bedroom and love having all their toys in one room to play with. In the past, Little Brother would always want to be playing with exactly what Big Sister was playing with but no longer. These days they are often in the same room but playing with different toys. There are moments of fighting and they are both learning how to control their anger or frustration but most of the time they are kind to each other. We have the excitement of Christmas and then it is 2017! A new year with new adventures! This special photos is from your visit to see Father Christmas at Harrods. 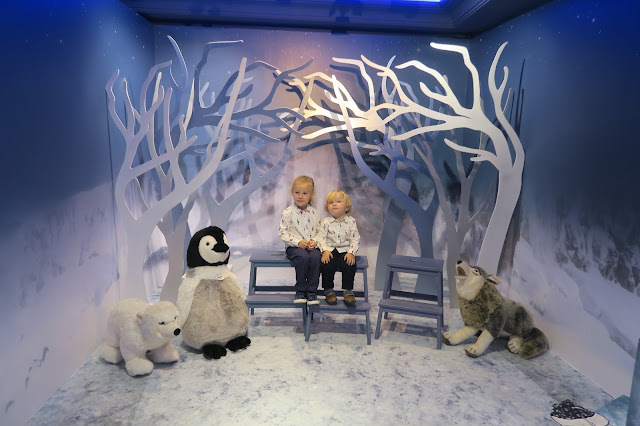 This the fifth year that Big Sister has wandered through the magical Santa Grotto at Harrods. 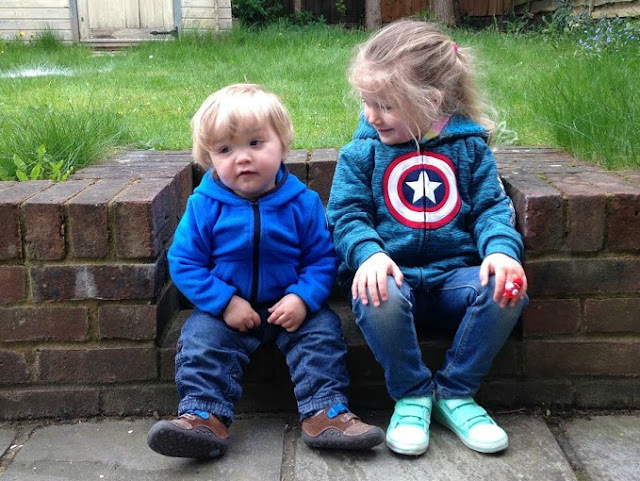 It was very special watching the confidence that Little Brother showed while exploring the grotto with his Big Sister. Majority of the time, he only needs his Big Sister near him to feel comfortable in new environments. Little Brother repeats and learn multiple words now each day. 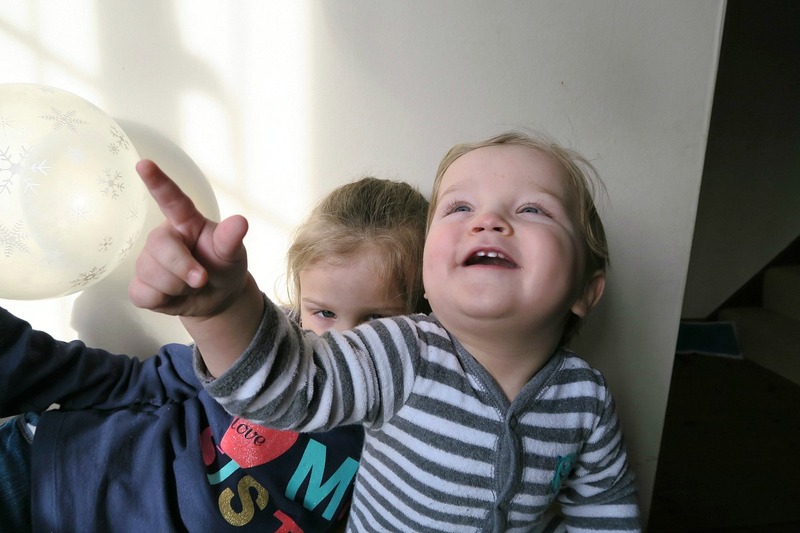 He loves call for his sister and gets very excited when it is time to pickup Big Sister from school. They have been very understanding as we pack up the house to move home. By next month's update, we will be settled in our new home. They are very excited for upcoming birthdays and Christmas the next couple months. 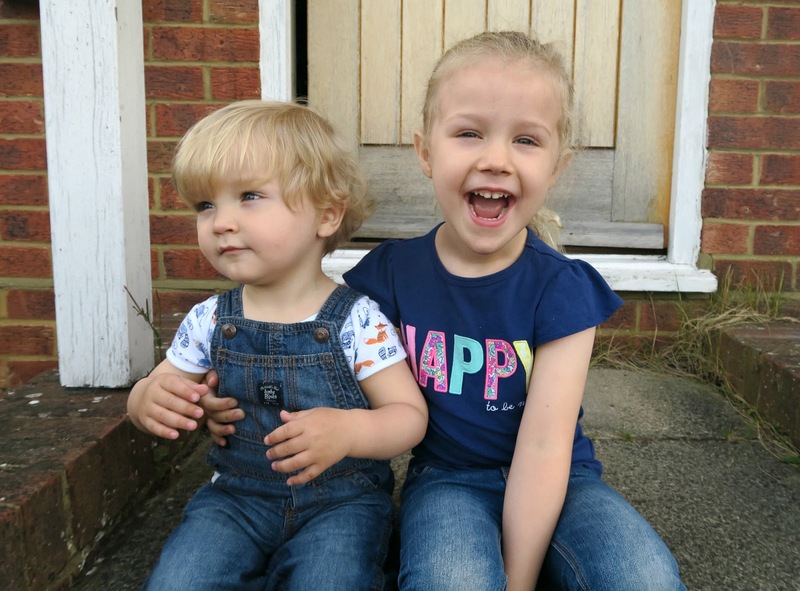 This photo were taken on a Saturday when they wanted to wear their matching t-shirts. Little Brother is constantly learning new words and challenging himself to climb higher or run faster. This past month, he grew those couple centimetres to be able to grab items off the edge of the counter and to turn door handles. Not that there was much bathroom privacy but now there is absolutely none. He loves repeating words back to you and he wants to join into conversations. 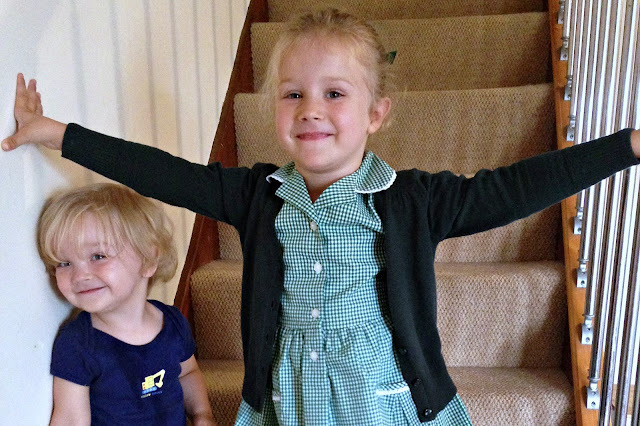 Big Sister is settling well into school and starting to really turn into a "Big Girl". There is a new sense of independence and confidence that is starting to show. There has some new ideas of "girls vs boys" stereotypes that are sneaking into conversations. The concept of pink is for girls and blue is for boys has been mentioned a couple times but then she still stays her favourite colours are blue and green so not much has changed. I always hope she will confident to choice what she likes and dislikes for herself and not be overly influenced by her friends. 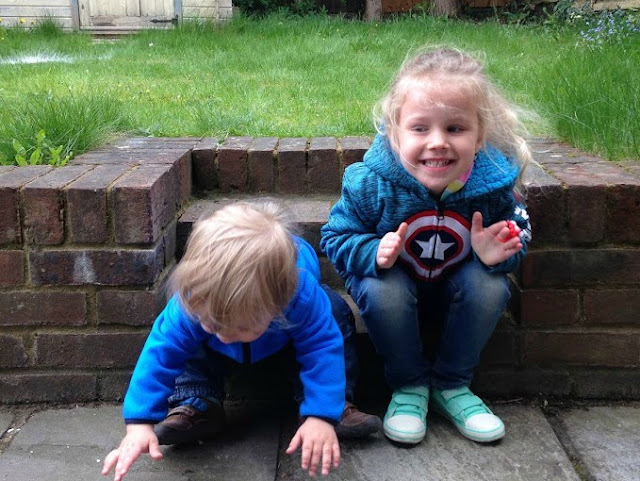 I am not quite sure if Big Sister is showing off her imaginary Wonder Woman bracelets or Captain America's shield but what I do know is that she definitely her Little Brother's hero. The end of August marked the end of Summer and the beginning of new adventures for both Big Sister and Little Brother. 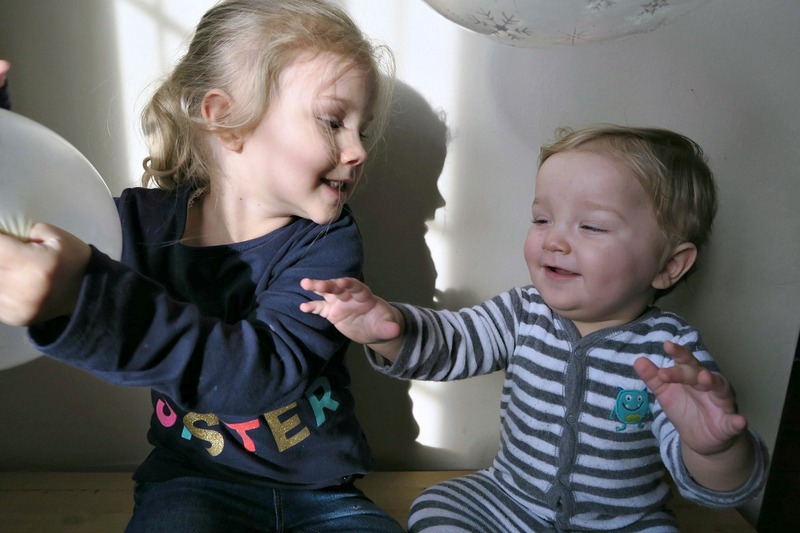 Big Sister stared Reception this year and meant she would be away from Little Brother for 5 days a week. By the end of Summer, I think they were both ready to have a small break from each but now their sibling bond seemed have become stronger. 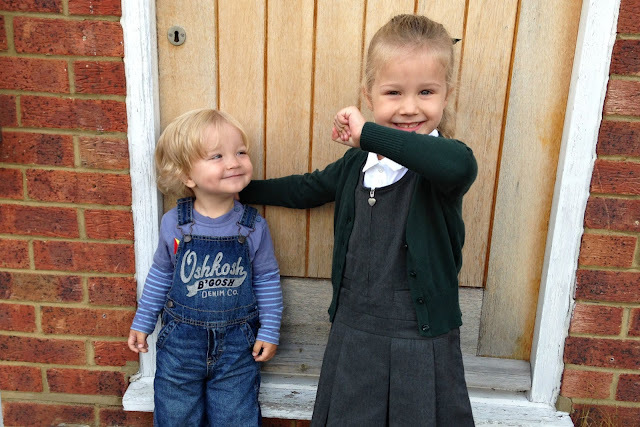 Big Sister excitedly dashed into school with barely a look back while Little Brother calls out to her. Most days he cannot wait to get his shoes on to pick up his Big Sister from school. Once they are home again together, they can be found sitting next to each other eating a snack. There is always big smiles for each other. Little Brother has also started spending to a couple morning with a childminder. Big Sister gave Little Brother her Superman backpack to use and told him to brave on his first day at the childminder. Big Sister asks lots of questions about her Little Brother's day at the childminder or with Mommy. She really wants us to pick her up from school and then pick her Little Brother so she can see her old childminder but mostly to be there when he gets home. Autumn is one of our favourite time of year and I think they are both looking forward to Christmas. I am sure the next couple months are going to fly by but I am sure they will continue to share life adventures with each other. Another month of trying to catch that perfect photo when both siblings are looking straight at the camera. Big Sister was in a silly mood and Little Brother kept getting distracted by the birds and clouds in the sky. They are both now have less than 6 months until their birthdays. Big Sister is very excited to start school in September. We have less than one month until this big change in her life. I must hide away her uniform or she would easily wear it everyday and maybe even to bed. She would love to spend every day this Summer at the park or just splashing around in the backyard. She definitely would prefer to eat only ice lollies these days. She has enjoyed making some yogurt frozen popsicles. Big Sister has decided that she should re-organise her clothes drawers. She spent 2 days sorting her clothes in piles and decided what category (pjs, trousers, t-shirts, etc) go in each drawer. She knows exactly what is in each drawer and likes to pick put her outfit for the day. She is working on preparing herself to more independent for school. Little Brother just keeps getting more clever each day. Everyday he is saying a new word or trying to do what his sister is doing. He loves getting items from the freezer and trying to "chop chop" his food. He loves the playground like his Big Sister and is super fast on the slide. Unfortunately, he has discovered how to grab onto his sister's long hair and pull. We definitely have had some tears. He is still my happy boy but does show his frustration when he feels that life is not fair. He has developed strong building block skills and loves creating tall building. Little Brother has loves having his Big Sister at home this Summer. I think it will be big change for Little Brother and Big Sister when school starts. Little Brother is going to start spending time with a childminder for a couple mornings but he will probably need additional opportunities to play with other children. Big Sister is very excited for school but I don't think she completely understands that she will be spending five long days at school. 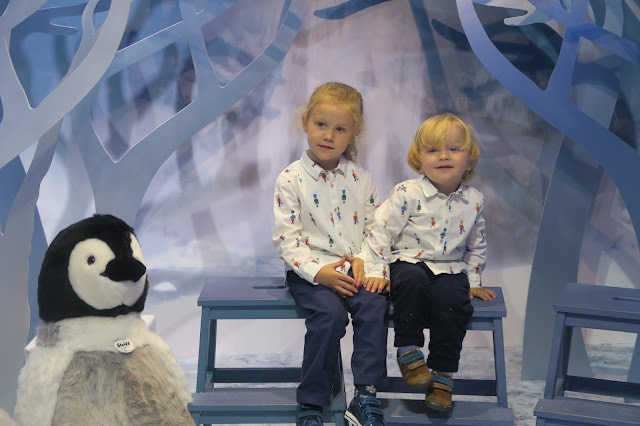 We are sure that Big Sister and Little Brother will adjust new school schedule together as a team. We are extremely grateful that Big Sister has a sibling to grow up. Big Sister and Little Brother are just too quick to catch sometimes for a perfect photo. 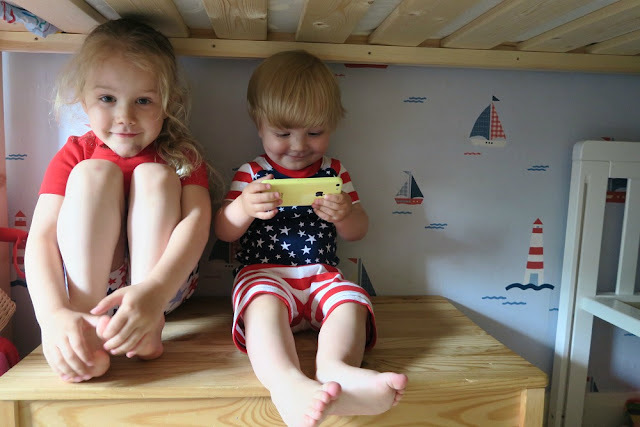 I was hoping to capture their 4th of July outfits from Grandma and Papa but it was very tricky. Big Sister has gotten to spend some time at her Big School. Summer Holidays are almost here and then it will be graduation the end of August at the Day Nursery that she has attended for 3 1/2 years. She loves practicing her letters and randomly counting to 20. Little Brother is learning new skills and words very quickly these days. We often are in denial that he actually is trying to speak to us. He is definitely understanding more instructions and reacting to our tone of voice. He loves going outside and playing with his sister. Big Sister's and Little Brother's relationship continues to evolve. They are forming a bond of children against Mom and Dad but then have moments when they need space from each other. Little Brother is verbally or physically fights back sometimes. I am so grateful that they have each other. 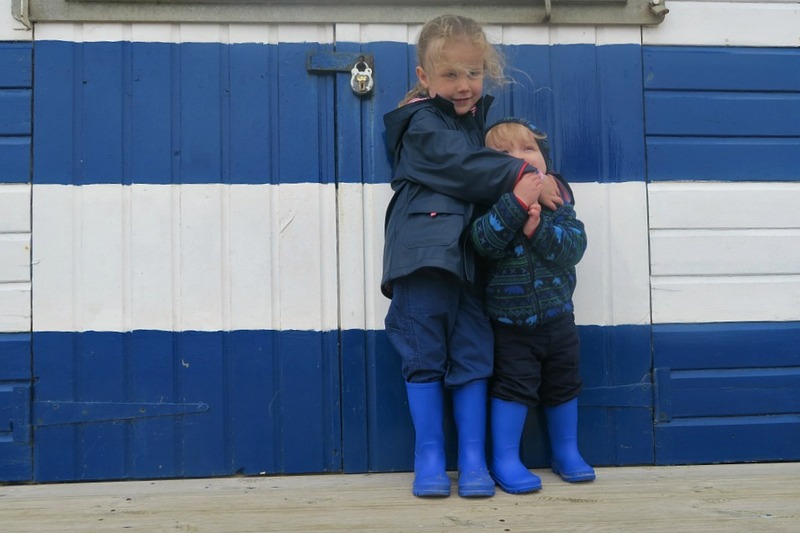 One of the highlights of the last month was our trip to Norfolk area for a family holiday. 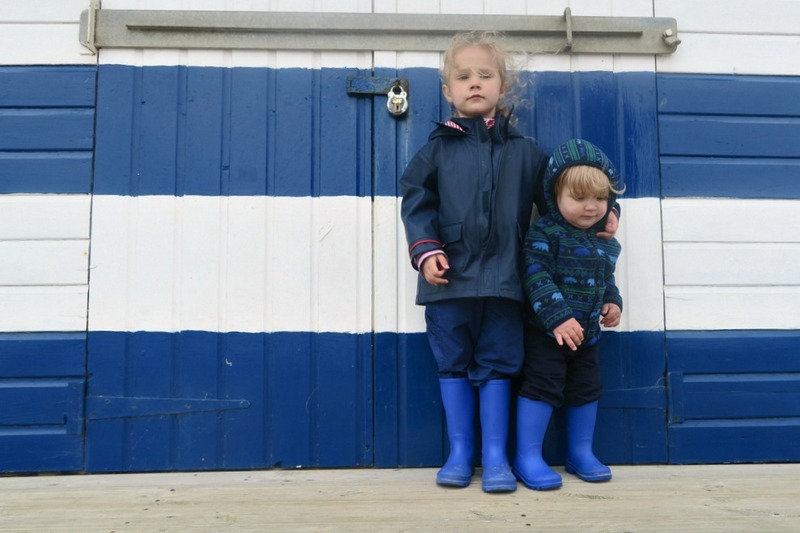 Big Sister and Little Brother loved running around the little cottage we rented. We had access to a private pool so Big Sister went swimming everyday with me and Little Brother had his first experience in a pool with the support of his Big Sister. Our favourite beach on the Norfolk Coast is Cromer. Big Sister and Little Brother loved digging in the sand. Little Brother discovered how much he loved playing with water and splashing in it. Big Sister helped Little Brother build some sand castles. We also loved looking at the colour beach huts. There was a couple that I loved but the photos this month is showcasing one of our favourites. Little Brother loves having new boots to walk around in. They have been very handy when he wants to go into the backyard of our home to play in the sandbox or water spout this month. Big Sister had to get matching boots like her Little Brother. Also on holiday, Little Brother refused to go to sleep until he knew exactly where his Big Sister was sleeping. A couple nights, Big Sister had to lay in bed next to her Little Brother until he fell asleep. The sibling relationship keeps evolving. Little Brother is definitely learning new words and trying to communicate. I continue to be amazed of how quickly he is learning about the world around him. He copies lots of his Big Sister's actions. He loves sitting at the table across from his Sister and stealing her food. He does not like it when his Big Sister takes toys away from him and he often fights or yells at her. 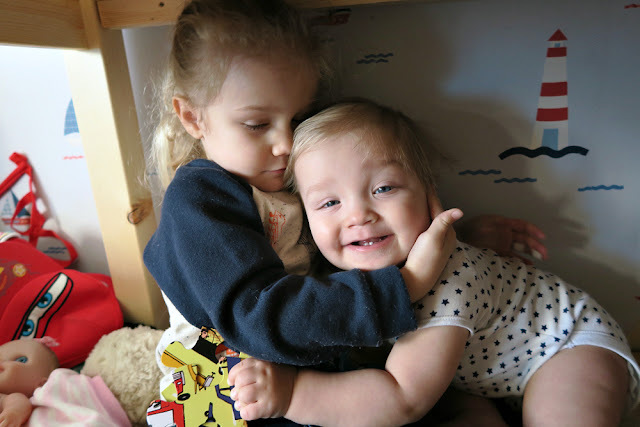 It is hard not to laugh at him yelling at his Big Sister but sometimes it ends up both of them crying and needing hugs. Little Brother is now official 1 1/2 years old (18 months). We celebrated his birthday with a decorated cake filled with lots of sugar and fun. Big Sister made a birthday card and loved telling everyone we spoke to on the birthday celebration day this it is was Little Brother's birthday. Big Sister and Little Brother definitely love each very much. We are loving spring and sunshine. The flowers are blooming and we have loved walking in the sunshine and splashing in spring rain puddles. It is official that Big Sister is off to school next September. We were allocated our first choice school. She asks almost daily about school and when she is going to start. She is excited that the uniform colour is one of her favourite colours. 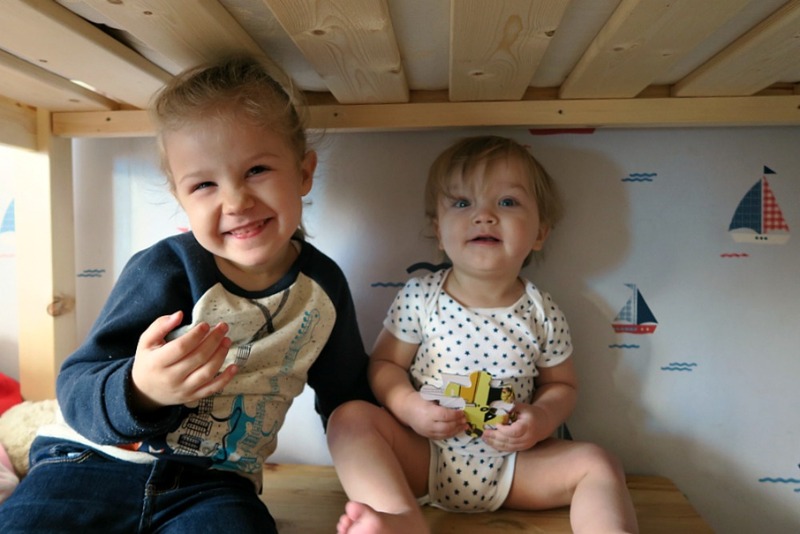 Her closest friends from Preschool are not joining her at her new school this September but she does have about 6 other Preschool pals that are moving to her new school with her. I just can't believe that she has only around 7 weeks left of Preschool. It just feels like another huge step in her life. 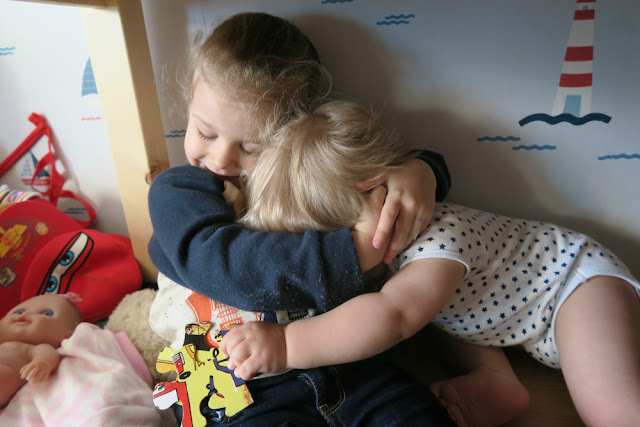 I love these set of photo because they showcase the beautiful, imaginative and caring Big Sister. She is wearing her Captain America sweatshirt and monster ring. Some days she is the Hulk or Spiderman or The Flash or Batman. She gives Little Brother, Mommy and Daddy super hero names often. I was told the other day that I was "Wonder Mom" (aka Wonder Women) while Little Brother was "Mini Spiderman". I love her imagination. She loves to be a Power Ranger with her buddies at Preschool. She continues to practice her letter writing and even has started to learn to spell my long name (Christina). She continues to be an amazing Big Sister to her Little Brother. There are still moments when there are tears over toys and a few unkind pushes but she still very protective of him. 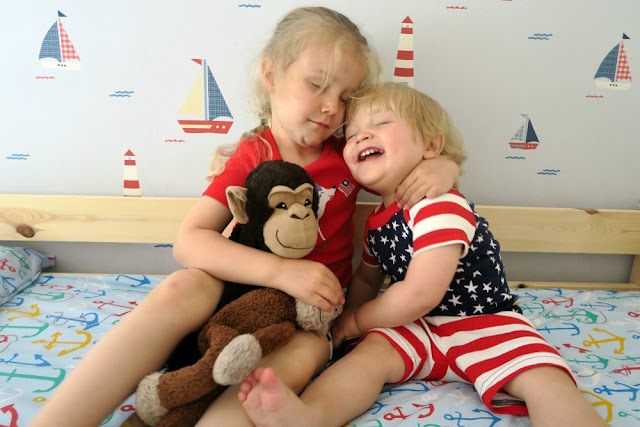 She crawls after him on the stairs or even pushes his bum to help him climb up on her bunk bed. She loves rubbing his head and giving him cuddles. The admiration that Little Brother has for his Big Sister continues to grow. He loves watching her and wants to be play with her constantly. He gets very sad when Big Sister pushes him away when she is tired and grumpy. He loves using pens and crayons but has not learned to stay on the piece of paper yet. Furniture has been drawn this last month but luckily no permanent damage. Litter Brother loves his new shoes and boots. He is enjoying digging in the backyard and playing with water. He surprises me everyday with his ability to learn new skills and new words. He is almost 18 months old and he definitely not a little baby anymore. He is constantly in movement and exploring. Big Sister really never explored the kitchen cardboard and drawers when little. 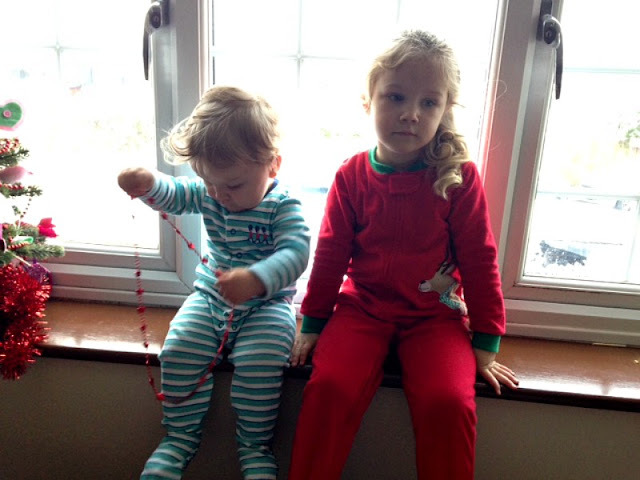 She loved playing with her traditional toys but Little Brother loves non-toy items. He would rather be playing with my hairdryer or trying to hack the password to my computer. He loves power cords and making noises with pans. I often find myself daily saying "He is so smart". I am sure that Big Sister when between age 1 and 2 learned new skills as quickly as Little Brother is these days but I did not notice as much. When Big Sister was Little Brother's age, I was working full-time. She spent most of her days during the week interacting with other people. It was also a very emotional time while we were trying for another child and unfortunately grieved over two baby loses before Big Sister was 2 years old. I know that we gave Big Sister lots of love during this time but I was distracted by life. I am feel very bless these days to be working from home and being able to spend 24/7 with Little Brother. I spend most of my day following him around the house and observing him learning new skills and words. 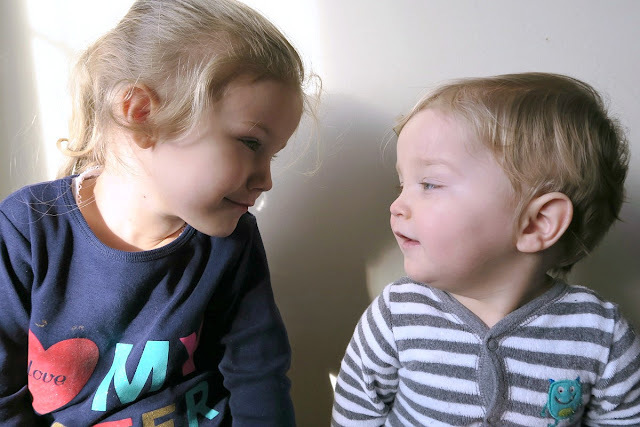 Just like this Big Sister at this age, he seems to understand what we are saying to him and tries to communicate back to us with pointing and some babbling. We feel very blessed to have these two amazing children in our lives and their laughter fills our lives with pure joy. The last month has been an a little unusual with break from our normal weekly routines. We had a fun Easter 4-day weekend in late March but then Husband was home from work for a week due to a bad back. We are now finishing up 2 weeks of break from school which include children be ill. We have spent lots of time around the house. 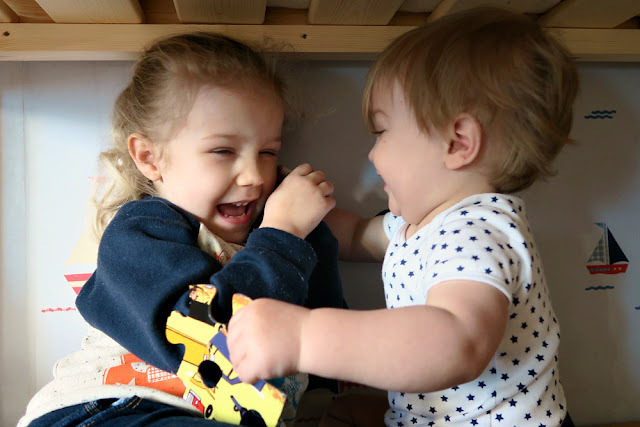 When it comes to childhood milestones or evolving sibling relationship it does not feel like much has occurred in the last month. 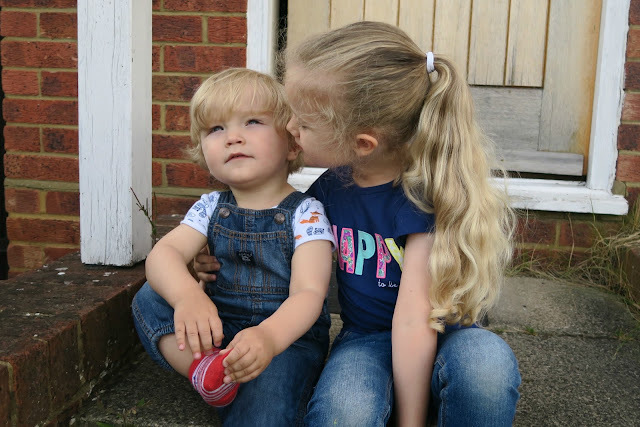 Big Sister was required to be very patient and understanding while Little Brother was fighting a bottom bug and a sore bum for around a week. She has been improving writing her letters and working on counting. She spent hours last week colouring and creating pieces of artwork with stickers. Little Brother is loving the freedom of being able to walk or run. He loves exploring the kitchen drawers and just chasing after his Big Sister. He gives his Big Sister lots hugs these days. This next week will be finding out where Big Sister will be attending school next September. 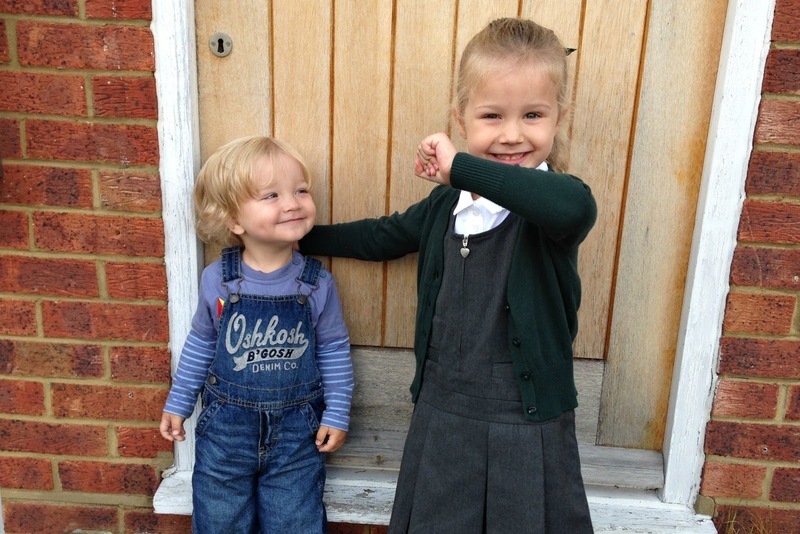 We are excited for Big Sister's new school adventure but Little Brother is certainly going to miss his Big Sister. We are all looking forward to more sunshine and outdoor exploring in the next month. 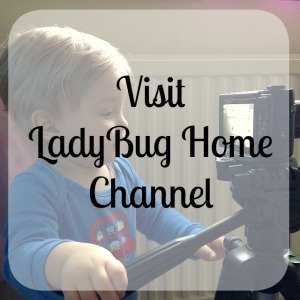 The last month has been very memorable with several childhood milestones for Little LadyBug (Big Sister) and Bumblebee Boy (Little Brother). The biggest milestone was Little Brother is now walking. He took his first confident steps on Sunday, February 28th and has not stopped walking since. I am still amazed when I see him walking across the room and most likely carrying a toy or some food to nibble on. He is rather steady of his legs but does think it is funny when he flops forward onto the carpet. Big Sister loves to see how fast he can walk while she holds his hands and pulling him across the room. The more physically developed Little Brother becomes the more he wants to be involved in what Big Sister is doing. 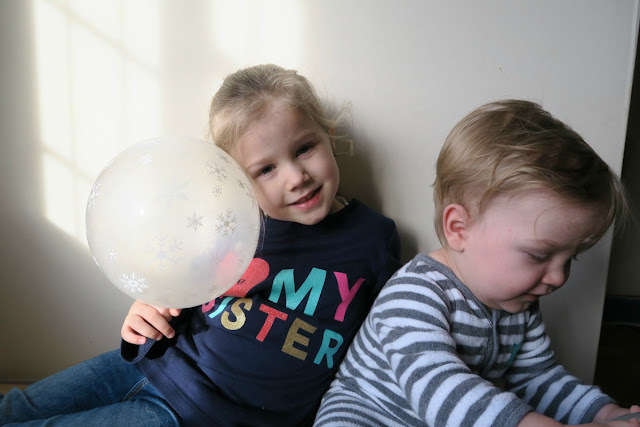 Big Sister has moments of patiently and lovingly playing with her Little Brother but when she is tired from school or towards bedtime the patience and understanding of her brother's actions are not always welcomed with loving arms. 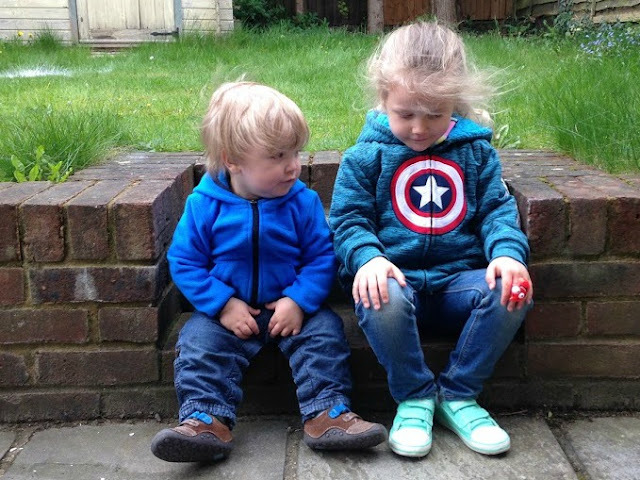 It is hard as a parent to see siblings fighting or hurting each other. Little Brother is still small but does push or fight back at times. I must admit that I smile when he yells back at his Sister when she yells at him. Fun times ahead! Big Sister must be continued to be reminded that her Little Brother does not understand the word "no" and why she does not want to play with him at that moment. Theses days there is increasing amounts of occasions that apologises and cuddles are needed in result of someone getting hurt. Big Sister is very excited that she has a new "Big Girl" bed. She gave her cot/toddler bed to her brother and now has a short bunk bed. She loves climbing up to bed and invite all her "babies" to join her. By raising the bed she has an area to sit with her books. 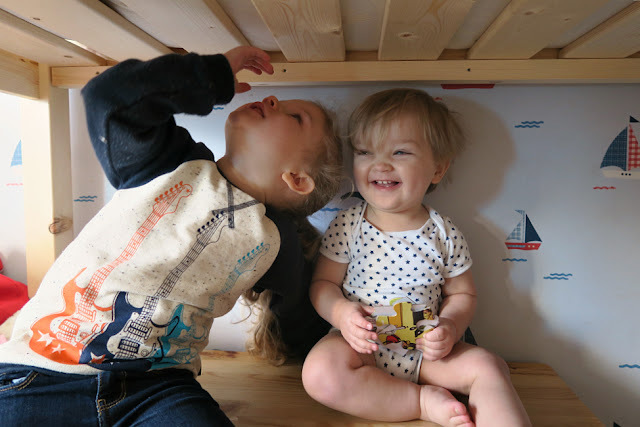 These photos were taken under Little Ladybug's new bed. She was very excite when the bed arrived and keeps telling everyone about it. She now can't wait to paint it with me. We chose a couple sample points of paint this last weekend. Daddy would prefer waiting to summer to paint but we are little excited to start. Big Sister's old bed has been given to her Little Brother to use. The front side was put back on to create a safe haven for Little Brother to sleep in. I am still cherishing co-sleeping with my cuddly boy but he has slept several nights in his new bed. I must admit that having a place to put Little Brother in that he can't escape from is very handy these days. Big Sister continues to work on writing her name and letters. She enjoys recognising letter in the environment around her. She is talking more about school next September. We have been doing some Easter and Spring themed crafting. We are looking forward to decorate eggs and doing some baking the next couple weeks. I love watching Big Sister and Little Brother interact and teaching each other life lessons. Little Brother is becoming more adventurous and inspired to try new activities because of his Big Sister. Big Sister is trying to learn to more patient and forgiving of her Little Brother's actions. The last month has been filled with Little LadyBug turning 4 years old, a weekend-away at the Norfolk Coast and unfortunately a winter illness. We are all took turns being ill so unfortunately there was not many photos taken this last month. I struggled with finding a couple months that represent the sibling bond that continue to grow and evolve each month. These photos were taken on our snowy Sunday. It was definitely an extraordinary day. 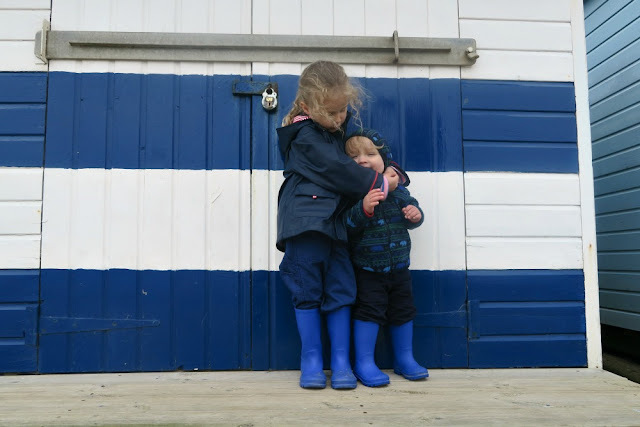 We spent Big Sister's birthday weekend in a lovely cottage in Norfolk. Then we celebrated her birthday with her friends a couple weeks later at the Make Believe Cafe, Berkhamsted. 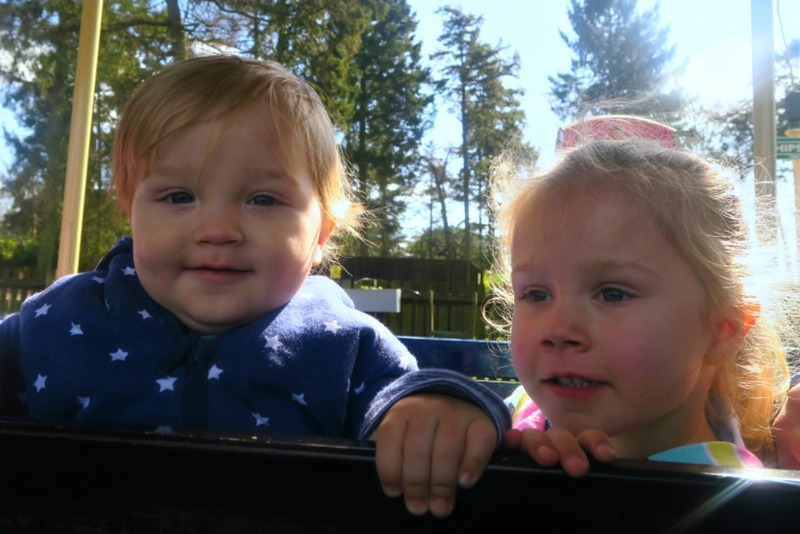 Big Sister's and Little Brother's sibling bond continues to grow but also getting a little more complicated. Little Brother is more adventurous with his climbing and wanting to explore his sister's toys. He does not understand why he can't pull his sister's hair and does not understand when Big Sister wants her toys back. 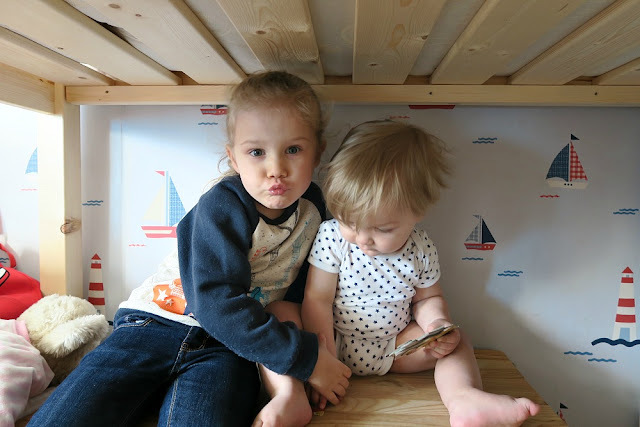 On the opposite side, Big Sister is still learning to be patient and understand that her Little Brother does not the consequences of his actions. There has been tears on both sides. Little Brother follows his sister around the house constantly and still thinks she is the funniest person in the house. Big Sister is working on learning her letters and now recognises a couple words in books. Little Brother has added "Ap..ple" to is vocabulary. No walk quite yet but any day now. Off the find out what the siblings are doing in Big Sister's room. The last month has included lots of grey cloudy wintry days but we have had some bursts of winter sunshine the last week. The minute the sun fills the living room with light and shadows, I can not help putting my children in the sun and grabbing my camera. The "sibling adventures" the last month included Christmas and back to school in January. This was the 2nd Christmas for "Little Brother" but last year he was very small and slept through the day of celebrations. Christmas Eve 2015 was a crazy day filled with lots of fun and new experiences. Big Sister joined me for a Christingle Service as the local church while Little Brother helped Daddy with some last minute Christmas shopping. The magic was during the evening when Bis Sister was too excited to sleep so encourage her Little Brother to get into mischief. Little Brother even ate Santa's mince pie. 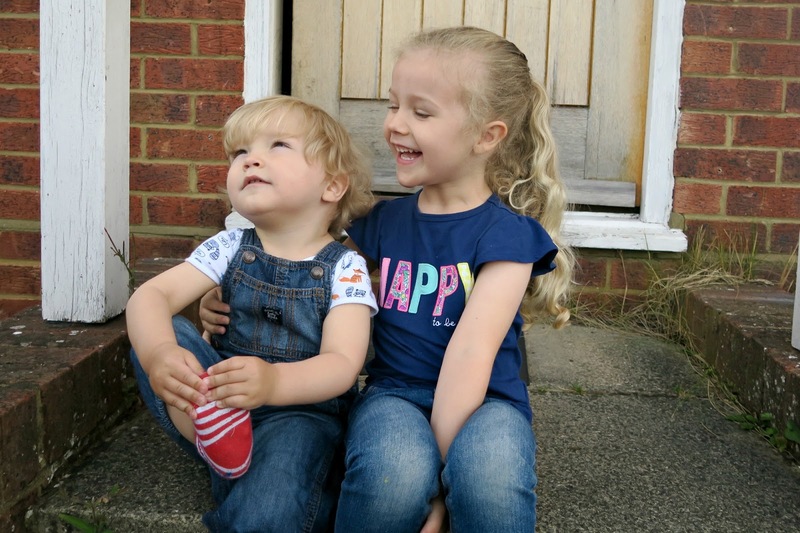 Big Sister helped her Little Brother open his presents and enjoyed playing with his new toys too. Big Sister was amazed to go to sleep and wake to discover it was 2016. The first full year of being siblings was complete and now it is time a new year of adventures. 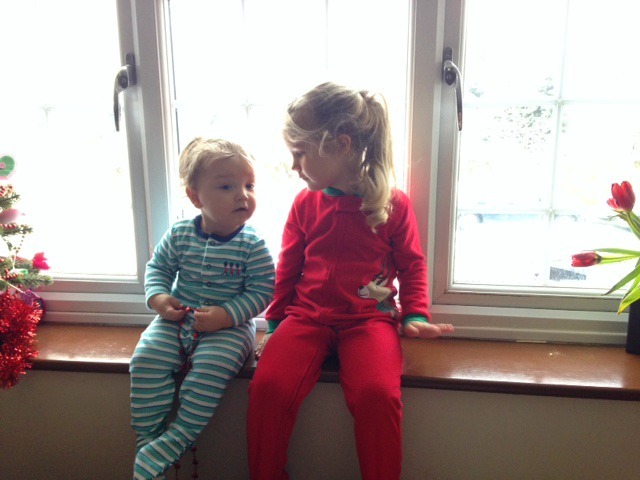 Big Sister returned to Preschool and Little Brother continues to miss her during the mornings apart. 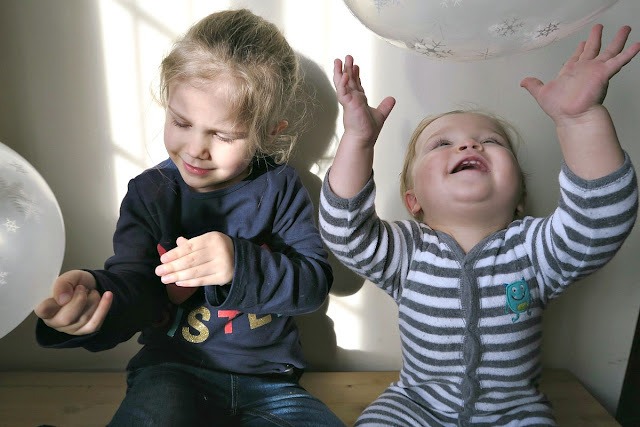 He gets very excited when she is back for Preschool and can play with him again. Big Sister and Little Brother love playing with each other toys and can most of the time found playing near each other. 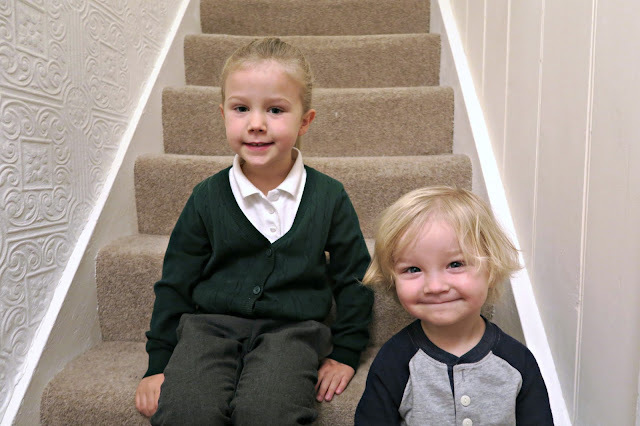 She crawls up the stairs behind her Little Brother to make sure he does not slip. Little Brother thinks that he should join her in the bathroom during her toilet breaks but we trying to keep them apart. Big Sister has been trying to teach him how to brush his 5 (almost 6 teeth). Big Sister is recognising more letters and working on writing her name. Little Brother is practising his assisted walking and I am sure that his "first steps"will be soon and probably towards his Big Sister. 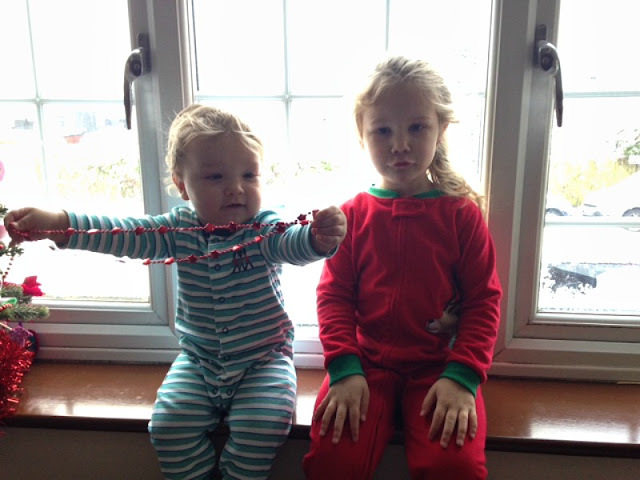 Big Sister has said that she would like another Brother or Sister but that is a discussion for another day. Thank you Donna for your constant support. The relationship between siblings is amazing to watch. Thank you for commenting. She can be the perfect "Big Sister" but at times not. It is a relationship that is always being challenged and envolving. It sounds as though your siblings have such a sweet relationship! They must be similar ages to my two (4yrs & 8months) I think. 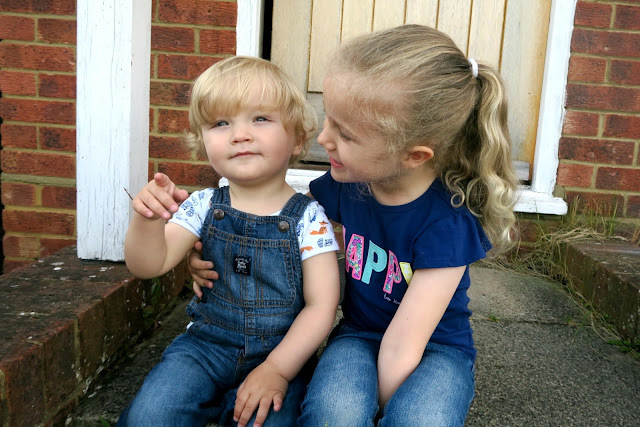 When my little girl heads to school in September this year I think baby boy will truly miss her, he already adores her but is too young to notice nursery days. Thank you for commenting. I do agree that it will be hard for Little Brothers when Big Sister goes off to school in September. I hope it means more quality time with son but he is going miss her like crazy. Big hug! Keep in touch and tell me how school preparation the next 5 months goes. Such a special bond siblings are developing. I can already see the "us" vs "Mom & Dad" forming. Thank you for commenting. Great sibling shots showing their cute relationship. I barely ever manage to get photos of my two looking at the camera, they are just too excited by each other and I love them for that. They look so happy together here and thats whats important!